This Cheesy Bacon Ranch Pull Apart Bread recipe is loaded with crisp bits of bacon, a punch of ranch flavor and ooey gooey cheese. An incredibly moist pull apart bread that will change dinner time forever. I've been playing around with some of my favorite flavors again. 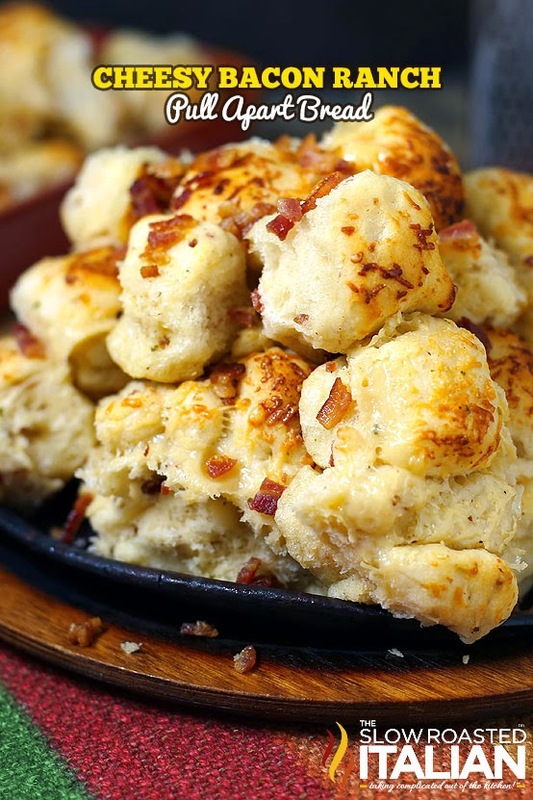 This time I have combined them in an outrageous pull apart bread that will rock your world! Ranch seasoning, crisp bacon and Parmesan cheese combined into my favorite subtly sweet tender milk and honey rolls. Possibly the easiest bread recipe ever. I am so excited to share these with you. We brought this bread to a potluck and the bread was devoured. We went nuts over it and I am sure you will too! Do you ❤ love ❤ TSRI? Don't miss another recipe. 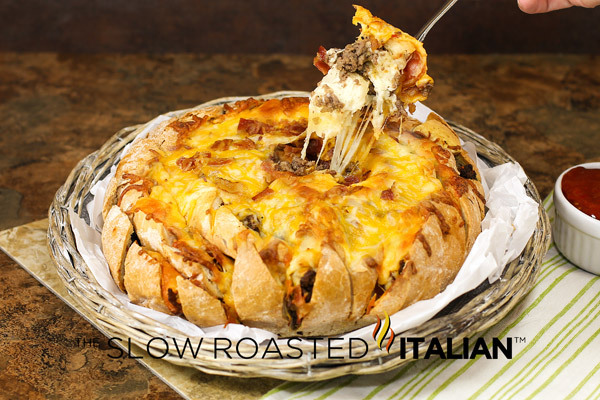 Click here to Subscribe to The Slow Roasted Italian by Email and receive new recipes in your inbox every day! Make sure you don't miss favorite pull apart recipes. Click on the image or the link to open in a new window. 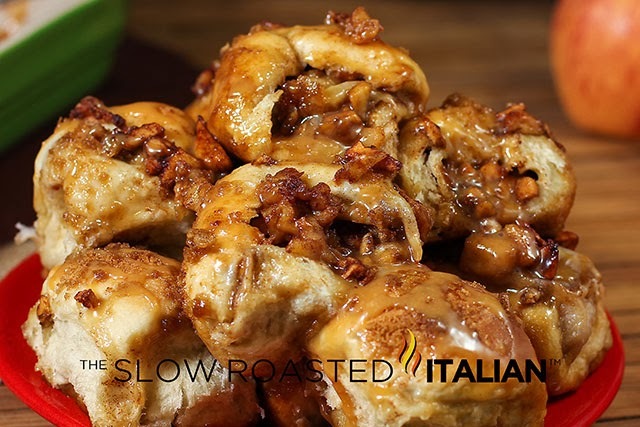 Crazy Caramel Apple Pie Bombs are the pull apart bread of your dreams. They are packed with caramel and apples and baked to perfection. Bacon. Cheddar. Ranch.... Need I say more??? This is dangerously good. 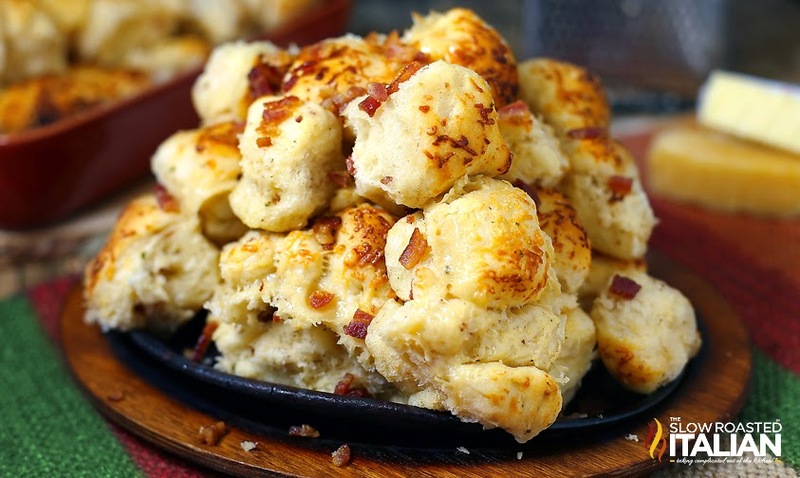 Bacon Cheddar Ranch Pull Apart Bread is insanely addictively delish! In the bowl of a stand mixer, add yeast, warm milk and honey. Swirl with your fingers or a spoon to dissolve the yeast. Allow to sit until the yeast starts to bubble and becomes aromatic, about 5 minutes. Fit stand mixer with a dough hook and add 4 Tbsp melted butter, 2 Tbsp ranch seasoning mix and salt, mix on low until combined. Add 2 cups of flour, mix on low, until smooth. Add enough remaining flour to form a soft dough (mine takes about 1 additional cup). Add bacon. Turn onto a floured counter top; knead a few turns until dough is tacky, not sticky. Form dough into a ball. Cover with a dry towel and allow the dough to rest while you repair the butter mixture. 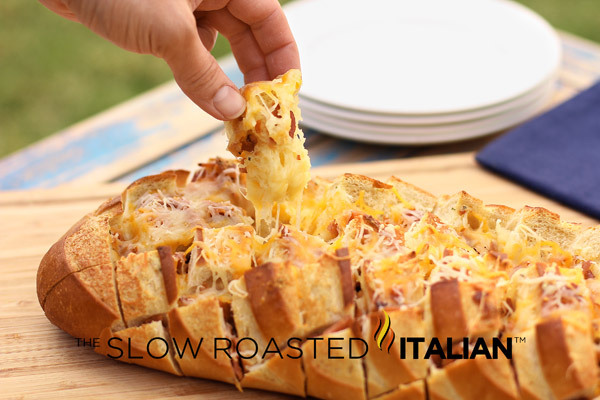 In a large mixing bowl combine remaining 1 sticks melted butter, 1 tablespoon ranch mix, ½ of the shredded cheese. Stir to combine. We are going to cut this ball into 48 (somewhat) even pieces. First quarter the ball of dough. *I used a bench scraper, but a butter knife would work too. Roll each quarter into a fat log. Cut that into 3 parts. Roll each part into a log and cut into 4 pieces. When you are done you will have 48 pieces. Place the 48 pieces of cut dough into the butter mixture and stir to coat as you cut. Continue adding pieces until all the dough pieces are in the butter mixture. Stir to coat completely. Evenly spread dough balls out on a 9”x12” baking dish. Sprinkle with remaining cheese. Cover with plastic wrap sprayed with non stick spray. Place in a warm location and allow dough to rise for 1 hour, until doubled in size. Bake for 20-25 minutes, check bread at 15 minutes if it is golden brown already, cover it with aluminum foil and bake for 5-10 minutes until all of the bread pieces are cooked through. Copyright ©2014 The Slow Roasted Italian – All rights reserved. Wow! this really does look like a easy recipe, my family would love this. "You should have a ball of tacky (not sticky) dough at this point." "Turn onto a floured counter top; knead a few turns until dough is tacky, not sticky." I think you meant we should knead the ball until it is sticky, not tacky? If it's already tacky when it comes out of the bowl, how do we know when to stop kneading? Great question Kalo! Thank you for stopping by. When you test the dough for 'tackiness' in the bowl you are feeling just the outside. Once on the board (counter top) you begin to knead, any stickiness that was inside the dough will be more available so you may need to add a touch of flour and continue to knead a few turns until it is tacky again. I hope that makes sense. Enjoy! Let us know how it goes.